IRVINE, Calif. - Toyota Material Handling, U.S.A., Inc. (TMHU), the supplier of the number one selling lift truck in North America, announced today the company's "Giving Veterans a Lift" program continues to gain traction in communities throughout the United States. As a result of the "Giving Veterans a Lift" program, Toyota Industrial Equipment dealer, Toyota Lift of Minnesota, recently trained 10 Marines of the unit MWSS471 to become certified forklift operators. 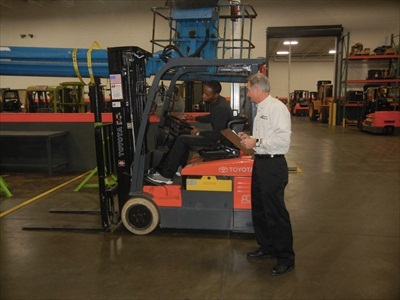 These certified forklift operators are applying their new skills to their jobs and the community, including operating forklifts to transport and handle the collected donations for the Marine Toys for Tots Foundation based out of the Minneapolis distribution center. In 2011 Marines, and other Toys for Tots volunteers, distributed more than 15.6 million toys nationally to over 7.2 million less fortunate children. "It is powerful to see the effect that the job training program is having on the community. This group of veterans have not only learned a new skill, but have also taken the extra measure to 'pay it forward' by applying it to help their communities," said Jeff Rufener, president of TMHU." Toyota's "Giving Veterans a Lift" program was designed with two elements: 1) an operator safety training discount program to help veterans learn a new job skill and find employment; and 2) a service technician program to assist its dealers in recruiting qualified service technicians while at the same time providing veterans with employment. TMHU, and the participating dealer, provide discounted forklift operator safety training for veterans. This program is available through December 31, 2013 via Toyota's network of participating dealers and offers veterans a $200 discount on the training. This is the same training the marines went through to learn how to operate lift trucks. Veterans also are encouraged to apply for Toyota Industrial Equipment (TIE) dealership service technician career opportunities at toyotalifttech.com. For every veteran hired by a TIE dealer as a service technician, TMHU will match a dealer's donation (up to $500) to Hire Heroes USA, a nonprofit organization dedicated to creating job opportunities for U.S. military transitioning service members, veterans and their spouses. To learn more about the "Giving a Veterans a Lift" program and the operator safety training program, visithttp://www.toyotaforklift.com/pages/training/veterans.aspx.